I first reviewed A Dog's Life in 2008. 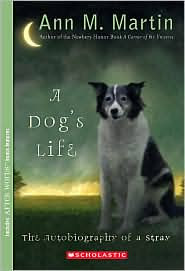 While stories about animals are hard for me to read because they always involve some kind of injury or cruelty, I read A Dog's Life because I noticed so many kids looking for a good dog story to read. Squirrel's story still lingers in my memory four years after reading and A Dog's Life continues to be a bestselling book at the store where I work, and all others I'm sure! To the best of my knowledge, A Dog's Life by Ann M Martin is the first children's book written from the point of view of a homeless dog with the dog as narrator. 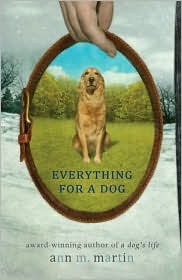 The Good Dog, by Avi, is told from the point of view of a malamute named McKinley, but he has a human "pup"named Jack. And, while McKinley is the tempted and changed by his encounter with a wolf, he remains a pet with loyalties to a human throughout the book. I'll be honest, I have never been a fan of animal/nature writing and movies and, since I had kids, I get weepy just looking at the book jackets and seeing the previews of animal stories. So, this is admittedly a genre I have very little familiarity with. I forced myself to read A Dog's Life because Ann M Martin, co-author of The Doll People, the Main Street Series and, yes, the Baby-Sitters Club Series, is a diverse, thoughtful, gentle, generous writer in the world of children's literature. I knew going into it that this is exactly the kind of book I avoid, especially since, in addition to the rest of the mini-menagerie that I tend to, I have been, as of four years ago, a first-time owner of a dog. An adopted dog. I do not know what the first seven months of her life were like. Of course this book set me wondering, worrying. And I do worry about her, as much as I worry about my own children. But, I am pleased to say that, I am very glad to have read A Dog's Life and it does have a happy ending - a very hard won happy ending. The narrator of A Dog's Life is a dog, Squirrel, who beings the story with the day of her birth to a feral mother. While her life as a stray is initially idyllic, living in an abandoned shed with her mother and brother, Bone, they are soon separated and Squirrel is on her own. This book has fear, hunger, brutality, abuse, violence and death in it. It has human beings who do horrible things to dogs, like throw them out of a car window when they are still puppies and adopt them at the beginning of the summer knowing full well they will leave their vacation house and the adopted dog behind at the end of the summer. But, the book also has empathetic, compassionate people who feed and heal animals. The narrator, who is given many names throughout the story, carefully details the hardships of her existence, the connection to her brother, the companionship she shares with another stray and, finally, (this is a kid's book after all, and therefor the only reason I struggled through every page, sniffling by the end) the experience of being loved and, for the first time in her life, feeling love for a human. I am glad that I read this book and can recommend it. I know there are kids out there who love animal stories. And, I know that kids have a disconnect that allows them to read stories like this and not burst out crying every other page and want to run over to the Humane Society and rescue a dog. So, it is with great pleasure that I suggest A Dog's Life, for it's interesting, intense portrayal of the life of a homeless dog and the people, dogs and animals she encounters. 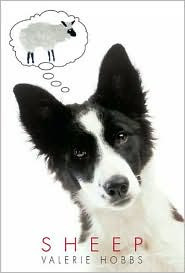 Everything for a Dog is the companion book to A Dog's Life. The story of Bone, Squirrel's brother, is narrated alternately by Bone and the two boys who enter his life. A coworker who is also a substitute teacher introduced me to Valerie Hobb's SHEEP! a couple of years ago. I read it, loved it and recommend it all the time. A bit shorter than A Dog's Life, it is every bit as action packed, sometimes harrowing, and filled with interesting characters, including a man who lives in a caravan pulled by goats. If your child enjoyed this book, I suggest The Good Dog, by Avi, another perennial bestseller. Also, Waggit's Tale by Peter Howe which came out in July 2008 seems to be a cross between The Good Dog and A Dog's Life. Waggit is an abandoned puppy who finds a home among with the mutts who live in the city park. Another pack of wild dogs and capture by the park ranger are constant dangers, and Wagggit's longing for human connection poses a dilemma for him as well. Bill Wallace is another author who specializes in humorous dog stories, without so much tension and danger, written at the 3 - 5 grade reading levels.